the ubertooth is a nice platform for some bluetooth stuff. but its a bit big so you need to make it somewhat smaller to make it work like you wand to implement it. check the nrf devices from nordicsemi. search for a controller that has bluetooth and usb and microntroller. maybe you can find a nice chip there to use for the project. maybe the nRF52840 is a nice one. best way to get a time is to ask for it by a ntp server. or grabbing it from a packet. there are some pictures video's in this topic. if i remember correct there was a serial port on the pcb. there was talk about it in one of the livestreams they did. the problem to get a better soc is probably due to the license fee and NDA's. what can make it difficult or more expensive to get better parts. i think you need another net mode. because the transparent will just pass all the data trough and you cant change any of it. the ps can only read the data. so netmode bridge, nat or clone is probably the one you need. @Niceday if you look at the manual of the GS105PE. 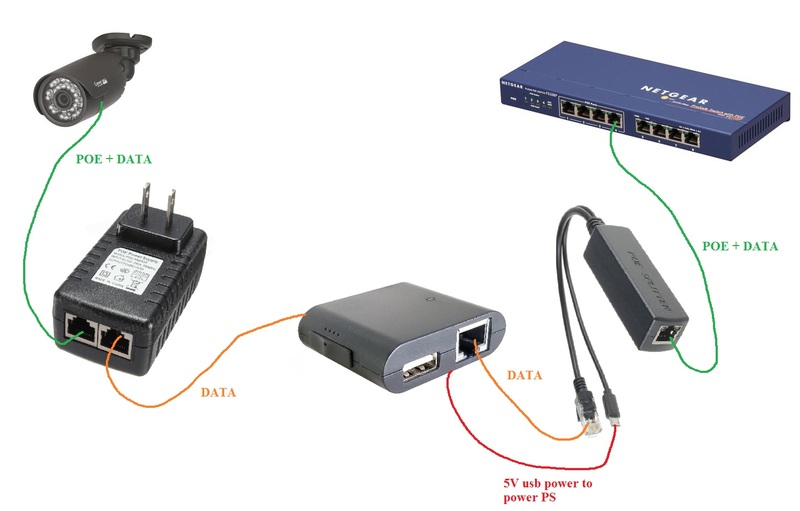 it says "POE pass-thru: 19W with 802.3at/7.9W with 802.3af input power" so depending on what power is supplied and what is taken by the phone explains why you are not able to also supply the PS+splitter with POE. @ThingEngineer if you look at this design you can see that the transformer is terminated and the 2 unused pairs. but if they used a different design then my info is invalid. You also don't have a POE PD controller so a standard POE compliant switch/injector will never give power because it can't sense the POE signature of the PD controller. A cheap injector that has always supply power on mode B may work. but i would not trust it and the mod to work long or perfect. We would only want a POE PD controller if the target device was not a PD and we wanted to activate the PSE or if there was no target device and we were just on an empty port and wanted POE. Neither of these were my case. SO MANY situations, I completely understand why Hak5 left out POE now lol. I don't want the Packet Squirrel to be a compliant POE PD. It's already a covert man-in-the-middle device. Why would I want it to say, "Hey Mr. Network Switch, could I get some nuts please?" Nope, I want it to be a quite little parasitic squirrel drawing just enough power to get by while not interfering with the typical operation of whatever PD is on the target side. A surprising amount of variation, I'm unsure that a "one size fits all" solution would be possible in a small(ish) package like the PacketSquirrel. Exactly! And that is the real reason (I believe) POE was left out. If I was going to complain about something it wouldn't' be the lack of POE it would be that it forces the target to negotiate down to 10/100Base-T. But again I understand, two more network transformers and other components for 1000Base-T would add quite a bit to the component count and therefore the footprint. And yea i agree with you the hassle to support POE. but it may be a nice idea to make a add-on for the PS. the add-on with the function of a POE extender and tapping the PS in between the data. So the switch will see a POE device and power it, but the data is flowing trough the PS. most of the POE extenders are just Ethernet extenders that make it be able to extend to 200m instead of the 100m specified by the IEEE standard and keep the POE function working. @j4mm3r sounds like there is a issue with the code behind the mode which talks to the wrong port. maybe @Sebkinne knows what happens. the PS does not have a real time clock so the date and time are random. @Just_a_User yea there are some different standards out there. but the 802.3at and 802.3af are IEEE standards that are world wide. and any POE compliant system would use this. So any POE you will come across in the field i am 90% sure it will be a 802.3at/af version. The only systems that will use something different are the old CISCO POE systems. those a proprietary and are not used in new CISCO switches any more. ubiquiti does have a 24v poe proprietary products beside the standard POE products. and because ubiquiti is pretty populair this might be a system you want to support on the PS. but you will have a different setup for supporting the 24V poe. I bought one of these to test out. @ThingEngineer the mod is nice. But i can see some problems with it. that are probably going to kill the PS or even the network equipment. I don't have any schematics of the PS but if the Ethernet jacks are terminated according to the IEEE standards then it will not like the POE voltage on it. The "bob smith" termination needs to be change to handle the POE DC power. With the standard termination getting POE it will apply the power to the data pairs to and there will run a high current trough those termination resistors. These resistors are 75 ohm. with 2 of them in series you get 150 ohm. with the POE of 48V you have a current of 320mA (48V/150 ohm) running trough it and its not design to handle this. There is around 15watt (48v*0.32ma) running trough these resistors. Then you pass the POE from one side to the other side. beside screwing up the termination of these pairs any gigabit switch will see the PS and the device you put in your PS. 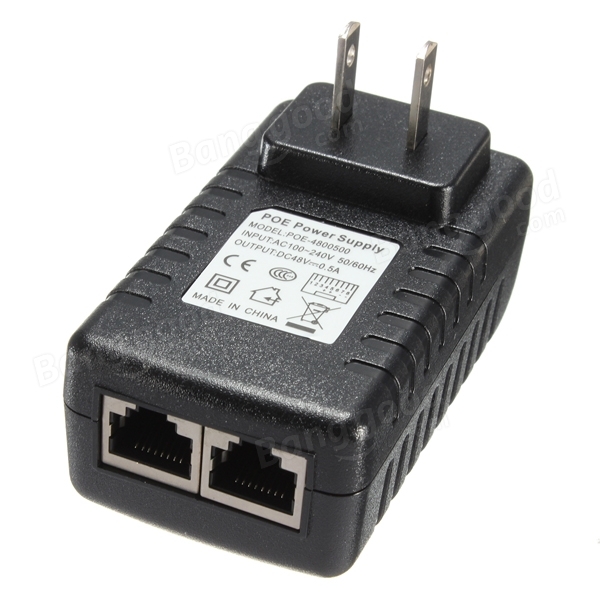 this can screw up the ethernet signaling (the network checking for a 1000mb or 100mb connection and data packets that may be send). Here is some good info about how to design a POE PD en POE PSE. You need a pse that supplys in mode B. Most of those are 100mb and use the spare pairs for the power. The only problem may be with the used transformers for the Ethernet signal in the switch en target device that will not like something in between. If you want to use POE you want to focus on the 802.3at (poe+ ~30W) and 802.3af (poe ~15w) standard. There are some other earlier standards but those are vendor specific, like the early cisco POE. Poe PSE (Power Sourcing Equipment) will only apply power to the wires if it "see" a PD (Powered Device) device according to the POE standard. There are some cheap injectors/switches that will apply always the power. but you want to avoid if possible because not all ethernet transformers like the DC power. A switch is classified as a "End Point" and a injector is classified as a "Midspan" in the standard. both are PSE equipment. A endpoint will apply its power in mode A which means that it will put power on the same pair as the 10/100mb datalines 1,2,3,6 . a midspan will apply power in mode B to the spare pare of the 10/100mb 4,5,7,8. But this also apply to a 1000mb line. but here the spare pair is also used for data. The system can use 2 pairs (mode A or B) or 4 pairs (both mode A and B) to supply power. but this depends on the POE implementation by the manufacture and the used POE chipset. It does not make out if you use a 100mb or 1000mb POE switch/injector if you plug in a PS you always get the 100mb connection. that is just the standard ethernet working. The POE PSE is not using any type of ethernet packet. it is checking the resistance of the PD to check what kind of power it needs. and does this with a DC voltage. The ethernet signals are AC couple on top of the DC and they will not interfere with each other. If you want to really understand how this is working you will need to read some datasheets on how this is handled. Some good reads can be found by linear and maxim. So capturing any POE communications with the packet squirrel is not possible. If you want to power your PS with POE get one of the active POE splitter that is linked earlier here. @Niceday yes those devices drop down the 50v to 5v (in the case of usb) for supplying power to a device. To power a POE device after the PS get a POE injector or switch. You can use a setup like this to get POE power to the packet squirrel and to the device (example a POE ipcam).